Pour one out for the Gold Guy tonight, my fellow gamers. A sage pillar of the industry has fallen. Just 154 days after acquiring LucasArts as part of their larger, $4B acquisition of Lucasfilm, Disney has dissolved the classic video game development company. Beginning today, Disney will continue to license out the LucasArts properties (namely Star Wars), but has ceased the development of all internal projects. Some projects (such as the incredible looking Star Wars 1313) may find new homes with other development houses, but their status is currently up in the air. While the move was not unforeseen (the company’s last few games haven’t been very successful, and rumors of projects being shuttered have trickled in since the acquisition), that doesn’t make today’s news any less disheartening. A part of my childhood — a part of an entire generation of gamer’s collective childhood, really — goes down with LucasArts. To the 150 people reportedly laid off today, and to everyone who had a part in the LucasArts legacy, we thank you. Thank you for bringing us into the world of Guybrush Threepwood and Monkey Island. Thank you for Maniac Mansion and Day Of The Tentacle, two games which helped to prove that video games could be funny, and somehow remain funny to this very day. Thank you for The Dig, a game that got me through a particularly terrible flu in the third grade and re-sparked my then waning interest in computers. Thank you for bringing Sam and Max into the digital world. Though they live on at Telltale Games (which, like Double Fine, is a team founded by LucasArts alum), LucasArts was the first company to see Sam and Max’s potential as more than just a lil’ indie comic book. Thank you for Star Wars: Battlefront (co-developed with Pandemic Studios, also since shuttered), The Force Unleashed, the X-Wing series, for your part in Knights Of The Old Republic, and for countless other memories. LucasArts had its hits and it had its misses, but their legacy extends beyond any one game, brand, or series. Their games defined genres, and much of the talent they nurtured throughout the 90s has gone on to define the entire industry. 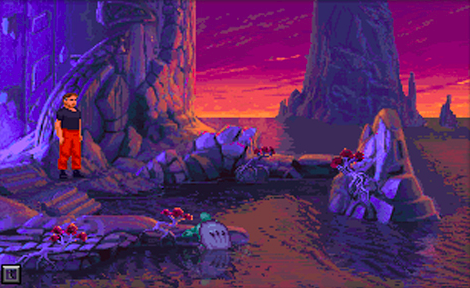 So long, LucasArts, and thanks for all the SCUMM.